We speak to actors Robin Holden and Alec Parkinson about their lead roles in Lazarus Theatre Company’s production of epic Greek Tragedy Oedipus, which is currently playing at the Blue Elephant Theatre. Alec, what can you tell us about Creon? He is a man who wears his heart on his sleeve and will fight till the death for what he believes in. Did anything surprise you about your character during the rehearsal process? I wouldn’t say I was surprised by anything but I find I will always make presumptions about a character. So I automatically went into this role being very aggressive and the challenge was finding the tenderness to Creon and not be an angry soldier too much. It’s a large ensemble. How easy has it been to engender team spirit? Very easy actually. Ricky [Dukes, the director] is very good at building an ensemble work attitude towards his productions. We are a team all striving for the same thing. You’re about half-way through the run now. How’s it going? Well, I don’t think we have peaked yet but we are constantly finding different parts of the play to bring energy to and we are taking ownership of this play together as the run goes on. What do you make of the contemporary warzone setting? I love it. Most of us like being soldiers as it is so far removed to what we all do. Do you like working at the Blue Elephant Theatre? It is a charming theatre with loads of character and will always be happy to come back. You’ve worked opposite Robin before. How do Oedipus and Creon compare and contrast to Othello and Iago? Ha, ha! I think Creon is actually more likeable. Othello has more of a journey and I also think most people end up liking Iago more than Othello because he’s such a well-written villain. I had a great time playing Othello, it was more emotional for me than this time around at the Blue Elephant, but I’m having real fun with Creon. Robin, you’re playing Oedipus. How do you view the character? Oedipus is an fascinating character: on the one hand he is simply a human being, driven by the same emotions and feelings as anyone else. A man who is strong, charming and charismatic, but also quick to temper and self-reliant to the point of arrogance. On the other hand though, he is heroic, in the true sense of Greek tragedy. Everything he is, and everything that happens to him is magnified to epic proportions; his strengths, his feelings, and ultimately his failings reach extremes beyond those of everyday people. The decisions he makes carry the weight of an empire, but are borne upon one man’s shoulders. The difficulty with playing him was reconciling the truth of him as a living breathing man, with the terrible fate that he not only suffers, but submits to as a fair judgement for his sins. I think anyone else might feel his punishment was a little unfair! How did you come to be cast in the part? I have worked with Ricky many times in the past, and he has been talking about doing Oedipus for some time now. He tends to get someone in mind for a particular role and I was lucky enough to be that someone! Did you shave your head for the role? I did! It’s been a long time since I’ve had hair this short – usually directors seem to want me to grow a beard, so this has been a nice change. My finacee wasn’t convinced at first, by now she’s quite come round to it so it might be staying short for a while! Why is Ancient Greek tragedy still relevant? I think for two reasons. Firstly humans haven’t really changed a great deal in the last three thousand years. Society may have moved on, and technology advanced beyond reckoning, but we’re still moved by the same primal feelings of love, jealousy, pride and anger. The emotions that Sophocles’ characters experience are just as valid for us now as they were for the ancient Athenians that he was writing for. His style may be considered simplistic by modern day standards, but that simplicity also gives it truthfulness. People say what they feel, they react immediately and honestly, their feelings are raw and untempered by reason. The language is poetic but rude and unembellished. Secondly they are simply great stories, and stories that are genuinely timeless. Oedipus doesn’t have to be wearing sandles and a toga for the revelation that he has killed his father and bed his mother to have any more of a punch! It doesn’t matter who these gods are they call to, or where Thebes is in relation to Corinth, the essence of the story, of a legendary wartime leader, fallen to blinded and banished peasant, is as heart-wrenchingly cathartic a tale now as ever it was. You’ve appeared in a number of Lazarus Theatre Company productions. What do you enjoy about working for them? No one else does theatre like Lazarus, certainly not on the London Fringe, but I doubt anywhere else either. I think what they achieve in such limited surroundings and on such a tiny budget is very impressive. Ricky Dukes has done a fantastic job of bringing epic theatre into venues that wouldn’t dream of staging anything on this scale. He’s very good at creating pictures, and it’s amazing to see what you can create with just the human body and very little else (bar some smoke and lights!). The only downside with being in a Lazarus production is you never get to see what it looks like! Ricky is also one of the most driven, hard-working and motivated people I know. One day he’ll get the chance to put something on the Olivier Stage – and it will be phenomenal. 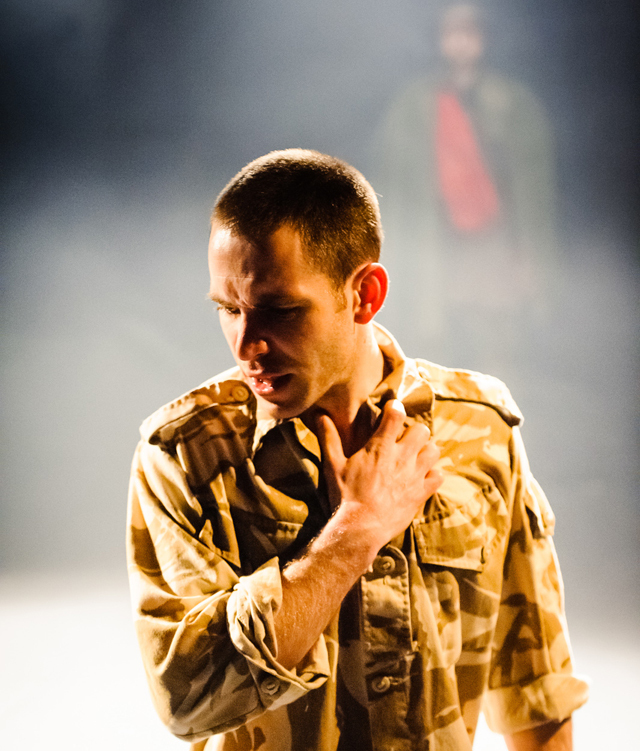 Robin Holden as Oedipus. Photo by Adam Trigg. It’s a fairly well known-story so hopefully this isn’t a spoiler… you spend a good few minutes performing a very emotional scene whilst blindfolded, shirtless and covered in blood. How did you approach it and what is it like to perform in front of an audience? To be honest I approached it much like any other scene. No matter what the text is, the job of the actor is to understand exactly what it is he’s saying, why he’s saying it and to whom. After that it’s just a case of playing within those boundaries until you get something that feels right for the character you’ve created. We specifically approached that scene with the intention to play it positively. The trouble with Greek tragedy (or any tragedy) is that we tend to endgame it: we know it’s going to end badly and so we play with all the doom and despair that we feel is warranted by the outcome. The thing is that’s not how people react to misfortune – they fight against it. It’s also not how most tragedies are written, and, fundamentally, it’s utterly painful to have to sit and watch someone moan and sob and be generally miserable for an hour and a half. So even in this scene, where Oedipus is at his lowest, we didn’t want him to wallow. We wanted to find the positivity, find the drive that keeps him going. After all, there’s a reason he doesn’t kill himself. Oedipus runs the gamut of emotions. How much of a challenge is it to perform repeatedly? and we all have our journeys through the play, it’s just that Oedipus gets to speak a lot more of his! But that feeling of flying through the show with fifteen other actors and the energy that creates is brilliant. At the risk of sounding completely wanky it’s a bit like surfing: you work hard to catch the wave every night but when you’re on it it’s terrific, and before you know it it’s all over and you’re washed up on the beach with rest of the actors and the audience wondering what happened! I’m rubbish at surfing. Kudos for trying! You’ve worked opposite Alec before. How do Oedipus and Creon compare and contrast to Iago and Othello? There’s far more of a genuine bond between these two than there was between Iago and Othello, and so I think that makes the dynamic of their relationship that much more affecting. They go from true brotherly love, to outright hatred and back again, in a way that is quite touching, and although Oedipus does his best to spurn Creon, the latter remains faithful to his friend. Iago on the other hand, never seems to feel anything but envy and hatred towards Othello, and it’s quite chilling to see the way he systematically destroys this great man. From an acting point of view it’s great to be on stage with Alec again. He brings a real genuineness and solidity to Creon, and the relationship between the two of us feels very natural and unforced. Thank you very much gents! 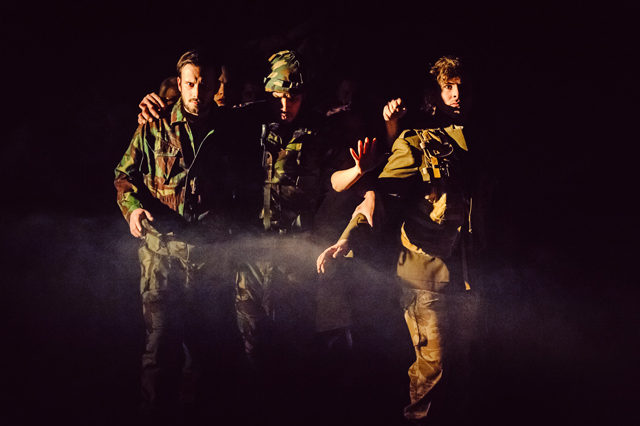 Check out our review of Oedipus, which runs until 23rd March at the Blue Elephant Theatre.